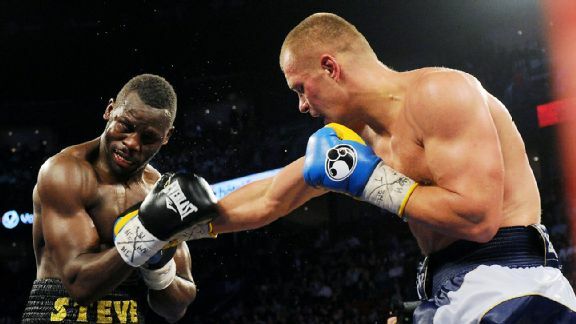 Heavyweight contender Vyacheslav "Czar" Glazkov won a very debatable unanimous decision in a slow-paced fight against former two-time cruiserweight titlist Steve Cunningham in a title eliminator on Saturday night at the Bell Centre in Montreal. Vyacheslav Glazkov, right, defeated Steve Cunningham by unanimous decision. With the victory on the undercard of the light heavyweight title bout between Sergey Kovalev and former champion Jean Pascal, Glazkov became one of the mandatory challengers for the winner of the April 25 fight between world champion Wladimir Klitschko and Bryant Jennings. All three judges had it for Glazkov (20-0-1, 12 KOs), 116-12, 116-112 and 115-113. ESPN.com had it 116-112 for Cunningham. Cunningham (28-7, 13 KOs), 38, of Philadelphia, was the busier fighter throughout the fight and also landed more punches. He landed jabs and body shots while Glazkov followed him around the ring and threw one punch at a time, but the judges gave him more credit. According to CompuBox punch statistics, Glazkov landed 144 of 441 punches (33 percent) and Cunningham got credit for connecting on 180 of 649 shots (28 percent). In the fourth round, Cunningham raised some swelling around Glazkov's left eye courtesy of the right hands he was landing. After the sixth round, trainer Victor Petrochenko, working with Glazkov, 30, a 2008 Ukrainian Olympic bronze medalist for the first time, pulled no punches, telling his man he was losing the fight. But it did little to fire up Glazkov, who continued to be outpunched by the busier Cunningham. A right hand from Cunningham dislodged Glazkov's mouthpiece in the ninth round, after which Naazim Richardson, Cunningham's trainer, told him he needed the late rounds -- and he was obviously right. Glazkov's face was marked up and he would not come forward while Cunningham continued to press the action, shoot jabs and try to engage. Glazkov, who was cut over his right eye, did come alive some in the final round, landing a hard right hand early and fighting as through he believed he was behind. It was the third head-scratching decision in recent fights for Glazkov, who won a majority decision against Derric Rossy in August in a heavily criticized result, as well as a similarly controversial draw with Malik Scott in February 2013 in a fight most thought Scott won. Light heavyweights Isaac Chilemba and Vasily Lepikhin squared off and hoped to impress enough to be considered for a title shot against the winner of the Kovalev-Pascal main event. While neither impressed, Chilemba was much busier, more accurate and dished out a beating to Lepikhin, who had absolutely nothing in a lopsided decision loss. One judge had Chilemba winning by shutout, 100-90, and two had him winning 99-91. ESPN.com also had it 100-90 for Chilemba (24-2-2, 10 KOs). From the outset, Chilemba, 26, born in Malawi and living in South Africa, was busy and landed hard, accurate right hands, including some nice uppercuts. Lepikhin (17-1, 9 KOs), 29, of Russia, had done so little and taken so many shots that, after the fifth round, his father and trainer Andrey Lepikhin told him that Chilemba was punishing him and asked if he wanted to stop the fight. But he allowed it to go on round after round, even though Lepikhin never picked up the pace or did much of anything except take punches and languish on the ropes. By the end of the sixth round, Lepikhin was taking a beating and his left eye was swelling and bruised. During the seventh round the crowd began booing because Lepikhin was doing absolutely nothing. By the end of the eighth round, Lepikhin's mouth and nose were bloody. Yet even though it was basically target practice, Chilemba could not stop an opponent who was not fighting back. The CompuBox punch statistics illustrated Chilemba's dominance, as he landed 192 of 683 punches (28 percent) and Lepikhin connected on just 75 of 289 blows (26 percent). Chilemba won his fifth fight in a row since a decision loss in a world title eliminator (a rematch of a draw) with England's Tony Bellew in May 2013.